Despite the whipping winds and icy temps we've been experiencing the past couple of days (chapped nose, anyone? ), we're quickly approaching that time of year when the weather becomes as unpredictable as ever. One day, you're wrapped up from head to toe like you're getting ready to go on a ski vacation, and the next, you're busting out a lighter coat — or leaving it home all together. While we can't control Mother Nature, we can suggest a must-have accessory that you can start wearing now and rock all the way through spring, too. 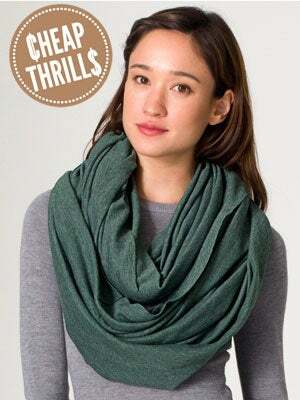 This simple circle scarf from American Apparel comes in dozens of colors and can be worn a multitude of different ways. So, if there's still a wintry mix swirling about, wrap this baby around that neck of yours for some cozy protection. Or, if you're looking for a little something to go over your bare shoulders once you bust out the first spring dress of the season, this versatile number can also be worn as a snug shawl — cooler than your grandmother's, promise. And priced at just $28, it's a small investment that will cover you no matter what's happening outdoors. American Apparel Unisex Circle Scarf, $28, available at American Apparel.